"At some point this summer, you'll get tired of grilled chicken. No matter the marinade or the delivery system, you will simply reach your limit, and that's when you need to reach for the chorizo. Impale a few slices of this famously delicious Spanish sausage in between your chunks of chicken. As it grills it will splatter its spicy, smokey fat all over its much blander skewer-mate, and once again you and grilled chicken will be good buddies." Place chicken and chorizo in a large bowl; add olive oil, sherry vinegar, oregano, cayenne pepper, black pepper, and salt. Stir until chicken and chorizo are completely coated. 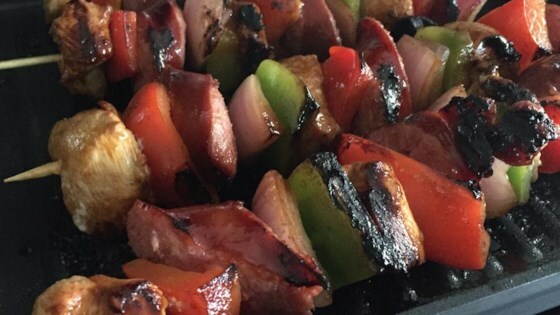 Thread chicken, chorizo, red onion, and red bell pepper evenly onto 4 skewers, making sure that each piece of chicken touches 1 piece of chorizo. Place finished skewers on a plate, cover with plastic wrap, and refrigerate until cold 15 to 30 minutes. These are terrific as-is! I think next time, I'll go total caveman and thread some thick cut bacon on them too. Total party food! Great flavor! The only things did differently was added fresh minced garlic to the marinate. Another great summer grilling recipe! We are vacationing and were not able to get all the ingredients so we adapted with dried oregano leaves, a little apple cider vinegar and no cayanne pepper. We all loved it! Super easy to make. My family didn't care for the skewered chorizo but I thought overall it was OK. I'm assuming if I had used another brand of chorizo that was firmer then it might have been different. My Hubby said this was Ok. On some of the skewers I added mini tomatoes, mini red onions, different colored peppers, zucchini and mushrooms.